Shyam Koul was a reputed journalist of the Jammu & Kashmir. Known as Shyamji among his colleagues and well wishers,Shyam Koul was one among the finest journalist of the state and was a great communicator. His knowledge of history of Jammu and Kashmir,and great insight into the psychology of political leaders and men who mattered from time to time had endeared him to journalists, intellectuals, political leaders and artists in a long illustrious career. 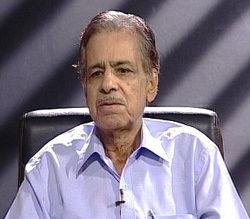 He served as correspondent of Radio Kashmir,Srinagar for a long time and was also associated with the national daily National Herald and Quami Awaz. He had been writing profusely, in different papers and journals, on the developments in Kashmir during the recent years, especially about the problems of displaced minority Hindu community of the Valley. He had done Post graduate degree from Aligarh University. Shyam Koul a journalist committed to his profession had a humble beginning from a remote village Safapora Manasbal in Gandarbal district. Known for his professional abilities, Shyamji reported Kashmir for a long period of time. Shyam Koul also remained executive committee member of Press Club of Jammu.